The Airline Service Quality Performance System (ASQP) provides information about airline on-time performance, flight delays, and cancellations. It is based on data filed by airlines each month with the Department of Transportation’s Bureau of Transportation Statistics (Office of Airline Information), as described in 14 CFR Part 234 of DOT's regulations. Starting in CY 2018, air carriers with .5 percent or more of total domestic scheduled service passenger revenues are required to report on time performance data for their flights. Prior to 2018, the reporting threshold was 1 percent of total domestic scheduled passenger carrier revenues. The regulation also provides for the voluntary reporting of a carrier's entire domestic system and voluntary reporting by other carriers. See the BTS Technical Directive for a current list of the reporting carriers. The reporting carriers have uniformly elected to report data on their entire domestic system operations. Several of the reports in the ASQP system use OPSNET delay causes due to weather, volume, equipment, runway, and other to validate and provide more detail on NAS delays from ASQP. 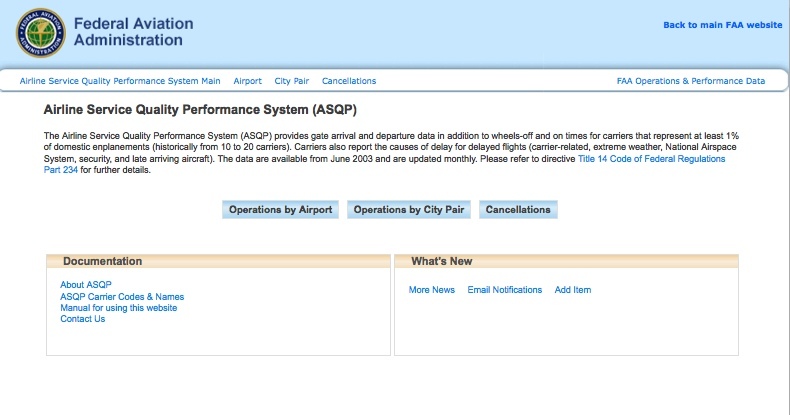 The ASQP system has two views: Operations by Airport, Operations by City Pair, and Cancellations. ASQP data can be viewed on the FAA Operations & Performance Data Web site. Starting in CY 2018, air carriers with .5 percent or more of total domestic scheduled service passenger revenues are required to report on time performance data for their flights. Prior to 2018, the reporting threshold was 1 percent of total domestic scheduled passenger carrier revenues. The number of reporting carriers can vary by year. ASQP provides data such as departure, arrival and elapsed flight times as shown by the Office Airline Guide (OAG), the carrier's computer reservations system (CRS), and the carrier's actual performance; selected differences among the three sources, such as delay and elapsed time difference; and the causes of delays. For more information about causes of delay, see Types of Delay. ASQP data are updated on a monthly basis, approximately 25 days after the end of the month. ASQP data are available from June 2003. ASQP data are available within 60 days after the end of the month; i.e., June data are available no later than September 1. Unregistered users can view Operations by Airport data. A login is required to access other parts of ASQP. ASQP data are typically not updated or modified after they are loaded, except in the rare case when a problem is discovered with the input files. View the ASQP Manual for a detailed explanation of how to create reports based on ASQP. For more information about these topics, please see the Definitions of Variables for the ASQP system. This page was last modified on 29 November 2018, at 12:34. This page has been accessed 35,509 times.